(Nanowerk News) Imagine being able to test your food in your very own kitchen to quickly determine if it carried any deadly microbes. Research conducted at Lawrence Berkeley National Laboratory (Berkeley Lab) and now being commercialized by Optokey may make that possible. The technology is based on surface-enhanced Raman spectroscopy, a technique for molecular fingerprinting. While SERS is a highly sensitive analytical tool, the results are not easily reproducible. As a scientist at Berkeley Lab, Chen and colleagues developed a solution to this problem using what they called “nanoplasmonic resonators,” which measures the interaction of photons with an activated surface using nanostructures in order to do chemical and biological sensing. The method produces measurements much more reliably. The potential applications, he says, are vast, including food safety, environmental monitoring (of both liquids and gases), medical diagnosis, and chemical analysis. Optokey’s customers include a major European company interested in food safety, a Chinese petrochemical company interested in detecting impurities in its products, and a German company interested in point-of-care diagnosis. The next market Chen is targeting is the smart home, where a nanophotonic sensor could be built to scan for pollutants not just in food but also in air and water. Trained at Los Alamos National Laboratory and Mount Sinai Hospital at NYU, Chen started out as a biochemist working on biomedical devices. 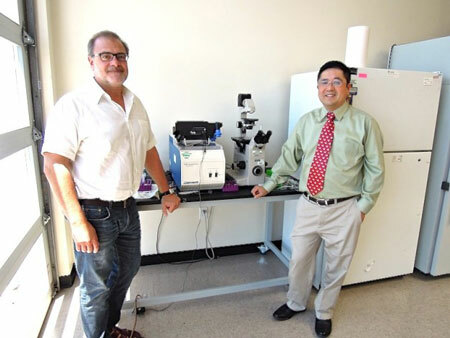 After he joined Berkeley Lab around 2000, he learned about quantum dots, which are nanocrystals with peculiar properties, and began exploring their use in biology. That led to further investigations into nanomaterials. One accomplishment was a so-called molecular ruler made of gold nanoparticles tethered to DNA strands, which, using plasmon resonance, was capable of measuring protein-DNA interactions. Ultimately Chen and his group developed about 20 patents involving hybrid bionanomaterials. The key discovery that led to the formation of Optokey was the development of the nanoplasmonic resonators to dramatically improve the signal and reliability of Raman spectroscopy. The method was initially used in the research lab to quickly and accurately detect a biomarker for prostate cancer, which has a high rate of false positives using conventional diagnostic tools. Optokey is a privately held company with about 10 employees. Besides Chen, the other co-founder is Richard Mathies, a UC Berkeley chemistry professor and world-renowned expert on Raman spectroscopy. The company was formed in 2010, and operations were launched in 2013.